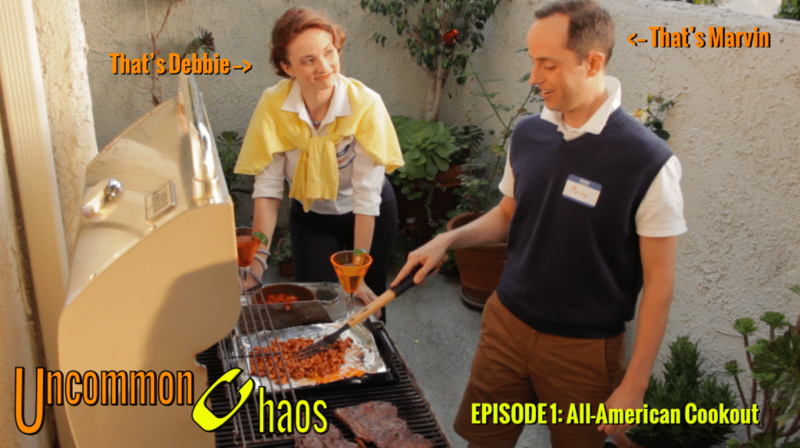 Welcome to sunny California where the birds are chirping in the trees, the ducks are frolicking in the river, and Debbie and Marvin–the first two chaotic creatures you’ll meet–are having a cookout. What could possibly go wrong? Next week, you’ll meet Eric and Billy, brothers-in-law and unlikely friends. This episode is especially exciting for me because it was my first stab at directing for film all by my lonesome. The gentlemen (including my fantastic co-creator Jason Lott) told me my stab was good–painless even. I guess I must be a practiced triage nurse by now. Subscribe today to get a special bonus video with Clark and Sunday (LA Eastsiders)! And check out www.UncommonChaos.com for more craziness. Uncommon Chaos… for when life’s common chaos just isn’t quite enough. Now that you have multiple episodes. Thought I would give them a second look! Delightfully twisted with a cherry on top! Why, thank you! We aim to please… and cause a little cringing.